Gipsy is a name of vessel Hanse 495 ,which was produced in 2012. You can charter this vessel from base Portisco in the region close to Sardinia. Gipsy is furnished with 7 berths. Berths on the yacht are arranged in 7 (6+1) scheme. 3 cabins are placed inside the vessel Gipsy. 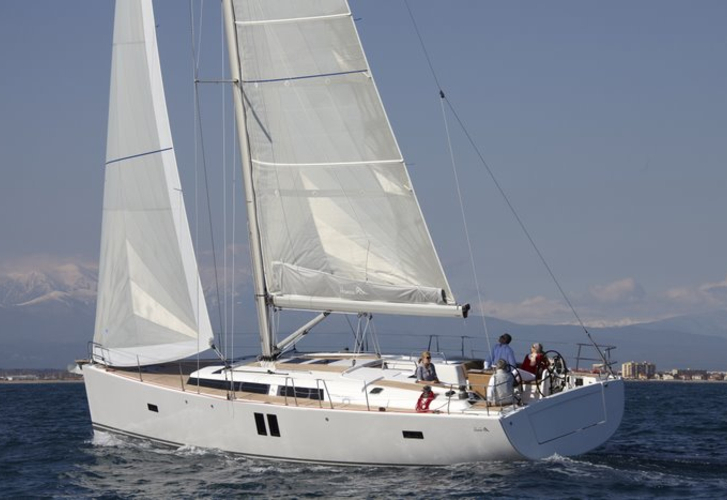 Search for other vessels by going to the section Yacht charter Sardinia. Guests can feel good on this yacht , because there are 2 WC for their disposal. With 300.00 l l. in diesel tank you can sail really far and still be independent because of 650.00 l l. in water tank. Gipsy is equipped with motor 75 HP Volvo Penta D2 75 SD. Vessel's dimensions are: lenght - 15.40 m , beam - 4.75 meters and 1.98 meters of depth. On the sailing boat you can make use of following equipment: Autopilot, Gps plotter, generator, Bimini top, Dinghy, Anchor electric windlass, Mainsail with lazy jack. . Security deposit there is 3500.00 EUR. In our search engine you can effortlessly check avalailability of yacht Gipsy from Portisco by going here: Yacht charter Italy.